January 26, 2016. That was the day. That was the last day. That was the last day I was going to wake up tired; the last day I was going to get winded going up more than one flight of stairs; the last day I was going to set a bad example for our 5 kids. I was going to become fit, healthy and strong. I was. Period. No excuses. I didn't care about the number on the scale. It was not going to be about a number to me. It was going to be about a shape - a fit, healthy, strong shape. I had made those decisions...with conviction. Now, where to start? That very afternoon came an email from Kerri announcing that FITstl was "coming soon". I knew that was it! That was my starting point! I have known Kerri for years, but had never taken advantage of the wealth of fitness knowledge she possesses. This time I was going to! I sent Kerri a text asking her which of her group classes she would recommended to someone like me, who was completely out of shape and had not exercised in more than 6 years. She was supportive and honest and genuine in her reply. I took my first class the day she opened FITstl - February 8, 2016. I struggled and pushed myself through the entire class. There were some, no MANY, things I could not do, but I told myself it was ok - baby steps. That afternoon Kerri sent me a text saying, "You did a great job today!" and, "Be sure to stretch more tonight". The next morning I could barely move. I hurt EVERYWHERE...and I LOVED it! For the first few weeks, I took 2 classes a week, because that was all my body could handle...seriously. Soon I was up to 3 classes a week ..then 4...then 5...then 6. 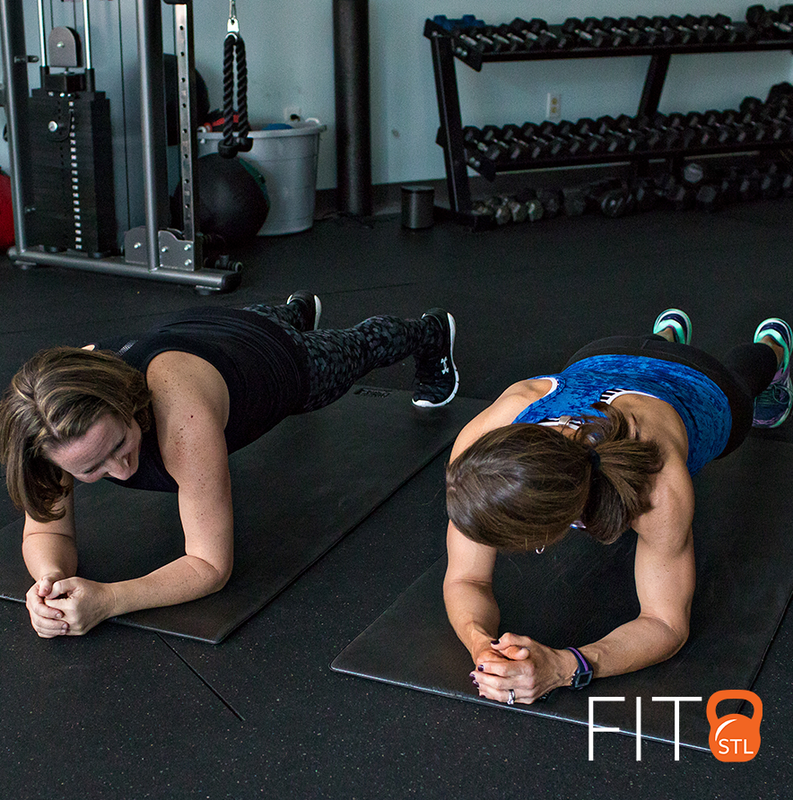 Along with the group exercise classes, I took advantage of the 16-week Nutrition Program taught by Jennifer McDaniel that Kerri offered through FITstl. Among MANY other things, it taught me that WHEN I eat is just as important as WHAT I eat. Now, one year later, I have lost 22 pounds, shed 5% body fat, gained lean muscle and completely reshaped my body. Exercise is now a PRIORITY for me. I schedule it. I don't ever skip it. I GLADLY get up at 5:00am to exercise, if that is the only time I can fit it in that day. Exercise is now a part of who I am. I do NOT wake up tired. I do NOT get winded after only one flight of stairs. I AM a good example for our 5 kids. I AM FIT! I AM HEALTHY! I AM STRONG! I know the commitment and determination to transform myself had to come from me. No one else can force that upon another. However, I could not have done it without Kerri's constant support. She has been my role model, my mentor, my counsel and my biggest cheerleader. THANK YOU, KERRI! And CONGRATULATIONS on your first year of business at FITstl!